Read the whole issue online! After experiencing the rainiest winter on record, Puget Sound families, it seems safe to say, have never been more ready for summer. 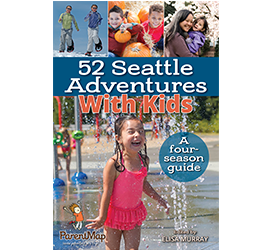 So get out your scissors, because our just-published Family Adventure Guide has a clip-and-save summer article for every kind of family. Got kids 5 and under? Our under-6 summer bucket list collects sweet summer outings perfect for the littles (and their big sibs). Ready for a rad road trip that immerses kids in a forgotten era of pioneer history? Grab your passports and head to a historic town in B.C. We’ve also rounded up inspired splurges; a beachy-keen guide to clamming and crabbing; and an argument for starting a family travel tradition.